Lainie Jones has had five primary cancers, as well as Li-Fraumeni syndrome. But she’s stayed optimistic and refuses to let cancer control her life. MDAnderson recently announced the beginning of a clinic for patients with Li-Fraumeni Syndrome at their cancer center in Houston, Texas. The Program is called LEAD- Li-Fraumeni Syndrome Education And Early Detection. Due the risk of many cancers associated with LFS, the LEAD program offers a comprehensive screening plan to detect cancers as early as possible. The LEAD has Adult departments(age 21 and above) as well as separate guidelines for children and adolescents(under the age 21). You may be eligible for LEAD if you have a confirmed diagnosis of Li-Fraumeni Syndrome. To become part of the LEAD clinic, a person will have to become a patient at MDAnderson and this can be done by calling their New Patient Line at 1(713)792-5410 and ask to be seen at the LFS clinic. If the person has not been tested for a germline TP53 mutation, but is at risk(for example if a family member is positive) they can have genetic counseling and get genetic testing through the LEAD clinic. If the person tests positive for the mutation, they will then be followed by the LEAD clinic and the screening guidelines recommended for them. Below are links to MDAnderson’s recommended screening guidelines for Adults and Children with LFS. As always, you should consult licensed professionals to help you determine the right screening program for you. 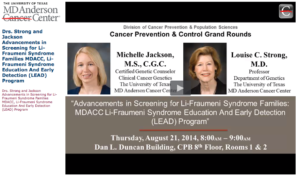 For more information about how the LEAD program came about and the direction it’s headed, check out the video below with Certified Genetic Counselor Michelle Jackson and Dr. Louise Strong who has been working with LFS families for over 30 years.